I am a home owner. A home on wheels owner. That feels good to say. Plus, I don’t owe any mortgage and I don’t pay someone else’s mortgage. It might not be luxurious like a home with multiple bedrooms, a nice jetted tub or double car garage. I also don’t own the land. But it has a functional kitchen, a cozy living room, a comfy bedroom, a shower and a flush-able toilet. And, I get to choose my backyard and my view whenever I want. What else do I need, really? Owning and living in a trailer is something I always considered doing. We had a truck camper a few years ago that we used for camping on rainy weekends and in the chill autumn days. Then we traded it for a 24′ trailer that ended up staying in the backyard for a whole summer until we traded it for a boat. At the time, we weren’t ready to live out of our town, further from our social lives. But years went by, and we grew up as the town developed, and after the series of past events, we decided it was the time to invest into a home. Not dealing with landlords Finding a place to rent in town for 2 adults, 2 dogs, 2 vehicles, and big toys isn’t easy at all. While the majority of accommodation aren’t pet friendly, only a few have parking for more than one vehicle. As for the toys, better find a place to store them. There was no way we could sign up for another year of steep rent and strict restrictions. We chose to stay at a RV Park/campground for the winter months. There are no restrictions on pets, parking, or toys. We go day per day, and have the freedom to leave whenever we want. Save money on rent and bills The daily rate includes full hook-ups (hydro + running water) and wi-fi Internet. There are laundry facilities and hot showers on site. Staying at a RV Park will allow us to save around $1,000 on rent and bills monthly. Personal ownership Owning a home without owing a mortgage is absolutely amazing. With $5,000 we managed to find a trailer that suited our needs. With a little bit of TLC and making it ready for the colder months, we are excited to turn this vehicle into a cozy home. And after the winter, we have the freedom to travel, or stay, or re-sell it, hopefully, at a similar price. Having the freedom to wake up in the setting that you want To wake up into nature, in a safe refuge tucked away from the hustle and bustle of the resort is refreshing and grounding. Whether you choose to live on the road, or stay at a same place for a period of time, the advantage of RV living is to have the possibility to choose your backyard. Can you live the compact life? Depending on what size and type of trailer you choose, it is most likely to be slightly smaller than your previous accommodation. Getting used to a smaller space is something to think about, especially if there is more than you living in. As for us, we left a 300sq ft bachelor to move into a 280sq ft trailer. We should be fine. Can you get rid of things you don’t need? Downsizing, downsizing, downsizing. I’ve been downsizing every time I’ve been moving, but this time is crucial for this new lifestyle. I had to get rid of things I didn’t need, or haven’t used in the past year. I donated TONS of clothing to my local women’s shelter and gave stuff to friends. As much as it was hard to give away certain items, it felt good and refreshing to own little, living off the essentials. Are you a fixer-upper, or have a friend that is? Having a trailer is like having a car: if you buy new, less work you’ll have to put in it right away. If you buy used, there are always things that need to be fixed. Either way, regular care and maintenance is needed. When we purchased our trailer, we had to fix the leaks on the roof, rip the moldy carpet, put a new floor, and now we have to winterize it and possibly build a roof for the winter. Luckily, my partner is very handy and that helps a lot. A community at a RV Park is usually very tight, and everybody will most likely be happy to help out. Are you ok with living further from town, but closer to nature? 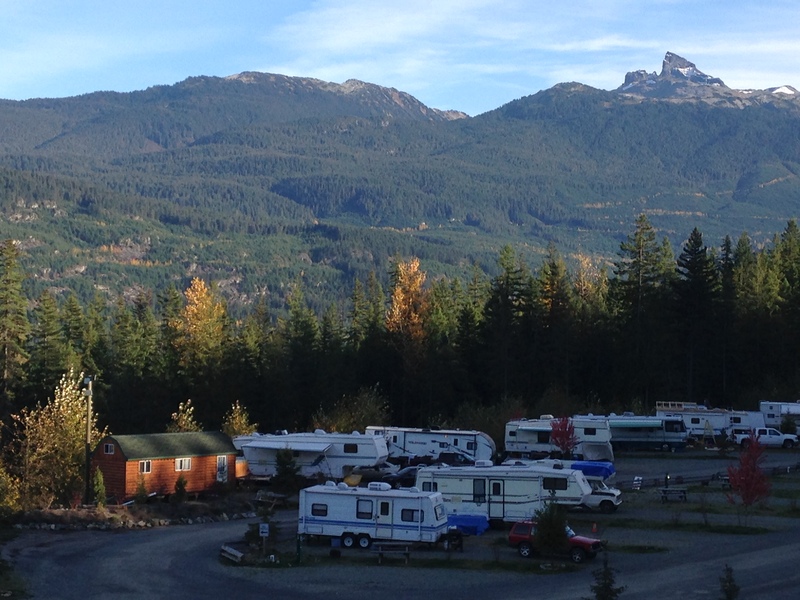 RV parks are most likely to be nestled in a natural surrounding. It is a return to the basics, living off-grid, away from the hustle and bustle. You might trade the cable TV to a good book, the gym for a walk in nature, and the nightclub to a bonfire with neighbours. I guess I was always meant for this! Are you willing to acclimatize to a smaller space in order to have an incredible backyard? Are you willing to own less to be able to live more? Are you a fixer upper and are looking to save money on rent, own your home and stop paying for someone else’s mortgage? Are you looking for an adventuresome lifestyle, away from the crowds, and closer to nature? Then look no further. RV living is just what you need. My new neighbourhood and backyard.